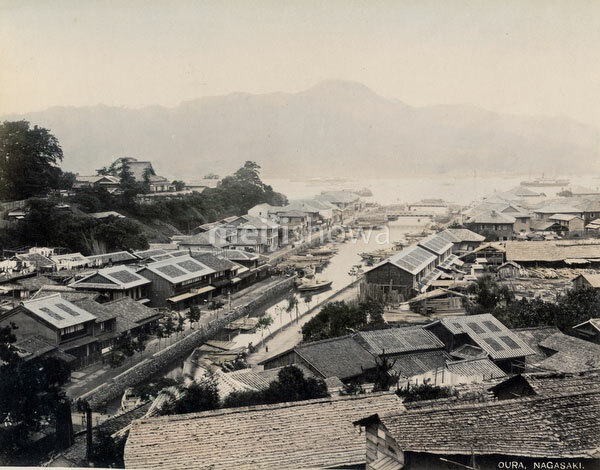 Panoramic view of Oura and Sagarimatsu in the Foreign Settlement in Nagasaki. The waterway in the center is the Ouragawa River (大浦川). Matsugaebashi Bridge (松ヶ枝橋) and Bentenbashi Bridge (弁天橋), both built in 1889 (Meiji 22), are visible at the far end. The Confucian Shrine (completed in 1893) has yet to be built, which conveniently dates this image to between 1889 (Meiji 22) and 1892 (Meiji 25). On the hill in the center of the image, the roof of the Myogyoji Temple (妙行寺) can be seen, with the square building of the Belle Vue Hotel (ベルビューホテル) located next to it.